There are many reasons for why we consider Tasks as one of the three main pillars of Fleep. In short, managing work in the form of a to-do-list or tasklist is effective, and we believe there is no better place for tracking tasks than contextually in Fleep, where work discussions happen and decisions are made. Internally, we often call it “contextual task management”. What we mean by this is that you can always see the context of the tasks created in the conversation and, if necessary, ask further questions or details about the tasks. We organize our product development in a slightly modified Scrum framework, and we use Fleep Tasks exclusively for managing our backlogs of tasks. You can find an in-depth overview of Fleep Tasks functionality in this blog post: Fleep Tasks help you get stuff done! 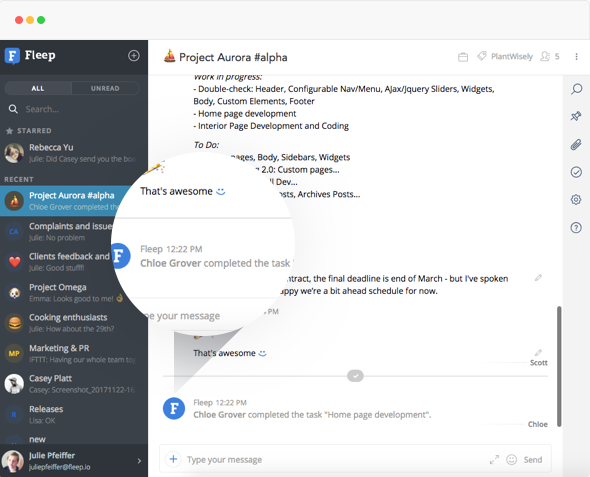 Recently, we’ve added some helpful functionalities to Fleep Tasks. Read on to see what’s new! We’ve added notifications for when tasks are completed. So, every time someone marks a task as completed, a system message will be posted that will notify all of the conversation’s members, informing which task was completed. By default, the notifications are switched on. If you find them too noisy or unnecessary, you can switch them off from the appropriate setting under Conversation settings. However, we hope the task completion notifications provide a nice sense of accomplishment and virtual high-fives all around. 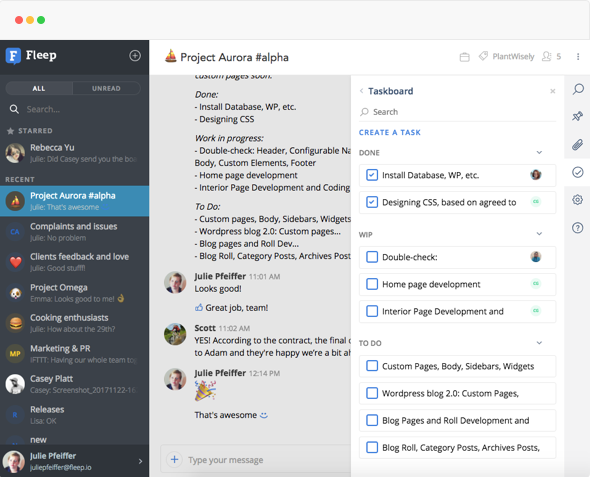 From our own use – and users’ feedback, of course – we’ve realized tasklists can get lengthy. 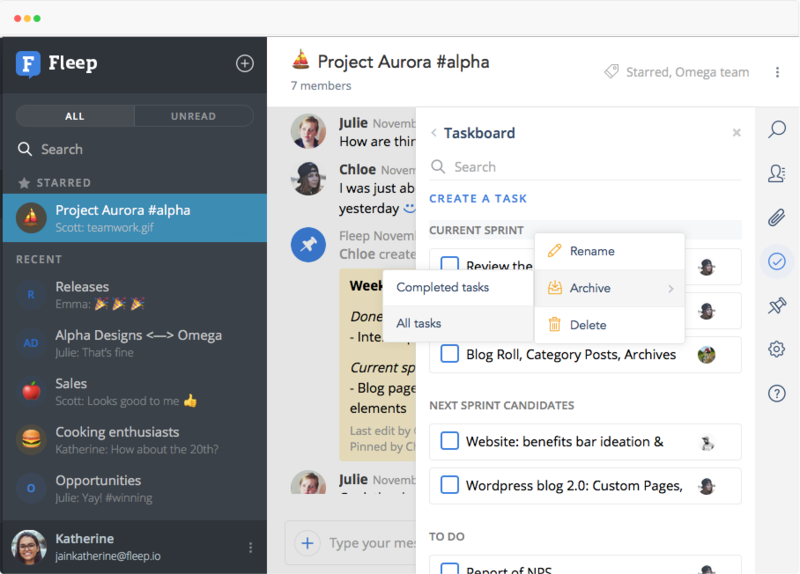 And if you use sections on Fleep Taskboards, moving tasks from one section to another can become cumbersome. For this, we’ve added the “Move to section” action. Just open the message actions menu on any task, and choose “Move to section” — and then what section you want to move it to. The task will then be moved to the top of the section you’ve selected. 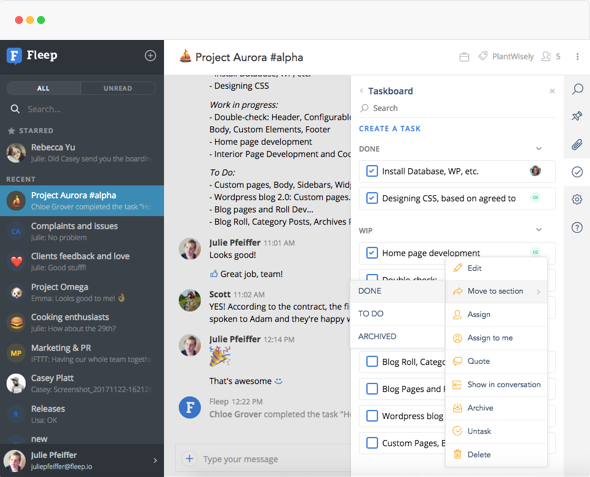 Previously, you could archive all tasks that were marked as “Done” with one click. Now, you can also choose to archive all tasks in a section, regardless if they are marked as done or undone. Quite recently, we rewrote major parts of our architecture. This included rewriting the code for our Taskboards, improving the experience of everyone using Fleep Tasks. And perhaps the biggest improvements can be seen in our Android and iOS apps, where the Taskboards are now significantly faster and more reliable. Last, but not least, we have brought back a nice little hidden feature for those, who use Fleep emoticons – you can click on any ((todo)) emoticon in the message flow to mark it as ((done)) and vice versa. You can even use these inside pinned messages or inside tasks to create sub-tasks within a task message! We’re working on one of the most requested Fleep Tasks features of 2017 – a My Tasks view. This view will give an overview of all Fleep Tasks assigned to you. My Tasks will be very useful for everyone who do not organize their team’s backlog in one dedicated Fleep conversation, but rather have them across different dedicated conversations. If you’d be interested in giving this a try in beta, let us know via Fleep Support! We hope you like the direction we’ve taken with Fleep Tasks! As always, feedback and requests are welcome via support@fleep.io . Let’s also stay in touch through our social media channels. We’re on Twitter, Facebook, LinkedIn and Instagram.